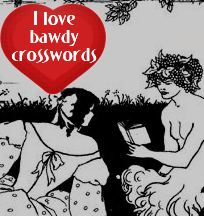 Bawdy Crosswords come in three delicious flavors. Pick the one that suits your taste. (1.) The simplest flavor should be staring at you now on your screen. Click on [JAVA] or a crossword's screenshot and you will see an interactive crossword. If you can't see it, you need Java. Follow what your browser tells you. For example "The plugin is disabled. Manage plugins." Follow link and make Java able. (2.) Those of you who'd rather print the crossword out and do it with a pen, just click on [PDF] and print it out. You can see a PDF version only if you have Adobe reader. If you do not have it, please download it here. (3.) The most attractive option is Across Lite. This allows you both choices of either doing it online in a large easily readable version or printing it out. It also offers lots of extras. You can download the program here. All programs are free, and there is no threat of any viruses. Any questions or problems, just let us know.